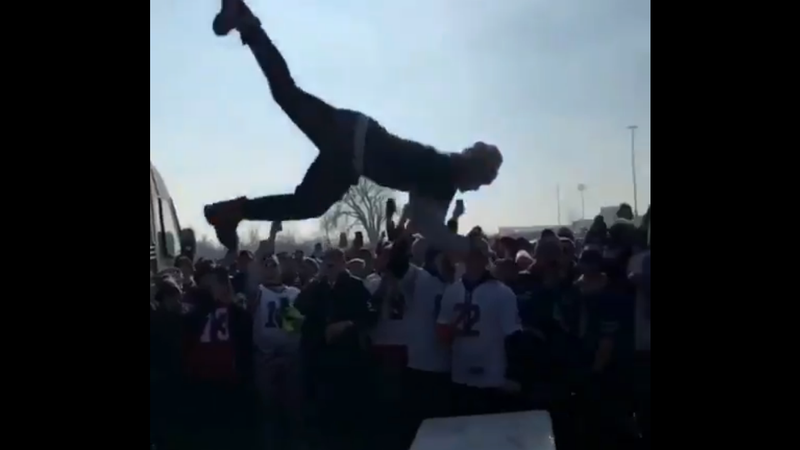 In the crazy world of Bills fans’ insane tailgate stunts, it’s hard to know whether knocking yourself cold by overshooting the table you’re attempting to break with your falling body is a failure or a success. In Bills fan culture, is this man a fool, or a hero, or both? There’s a dangerous current of one-upmanship to these Bills fan stunts—we’ve seen Bills fans ruining their legs, and bouncing cruelly off of tables, and lighting themselves on fire—so this sort of brain injury is a virtual inevitability. I would like to urge Bills fans to please consider using their butts to smash the tables, instead of as deeply unhygienic drinking vessels. Thank you.